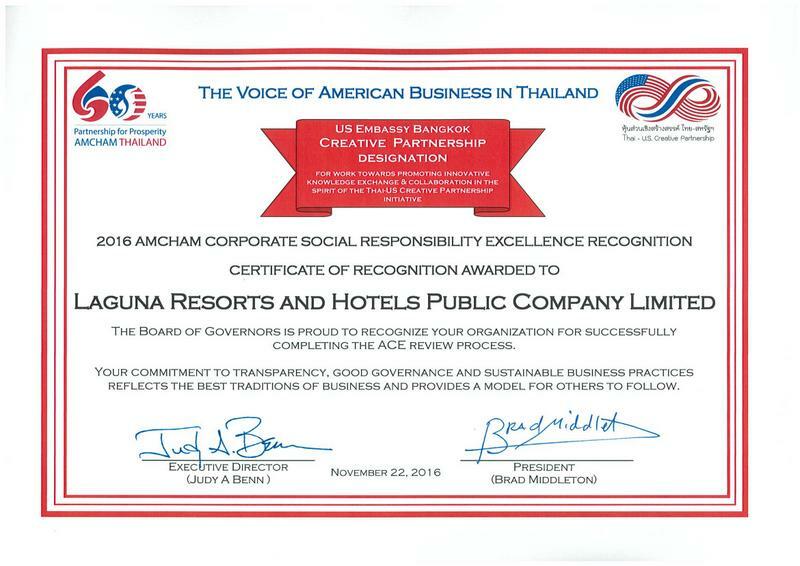 PHUKET: Laguna Resorts & Hotels PLC, better known on the island simply as Laguna Phuket, has won three prestigious awards bestowed by the American Chamber of Commerce (Amcham) in Thailand in appreciation of the resort’s long-term contribution in CSR and community development. US Ambassador to Thailand Glyn T Davies (left) hands the US Ambassador's Award to Peera Pomsook (right), CSR Manager representing Laguna Resorts & Hotels PLC (Laguna Phuket) at the 2016 AMCHAM CSR Excellence (ACE) Award in Bangkok. 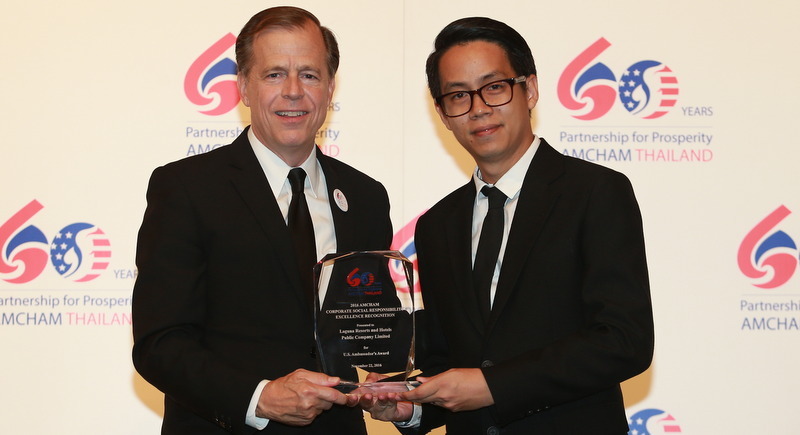 US Ambassador to Thailand Glyn T Davies (right) hands the Amcham CSR Excellence (ACE) Award to Peera Pomsook (left), CSR Manager representing Laguna Resorts & Hotels PLC (Laguna Phuket), at the 2016 AMCHAM CSR Excellence (ACE) Award in Bangkok. 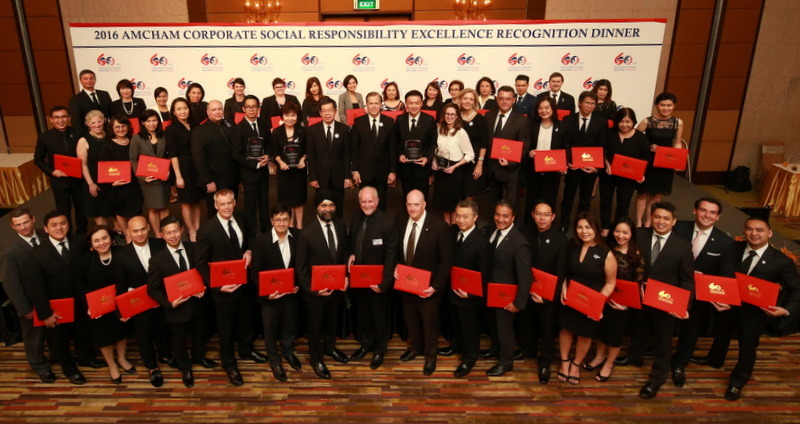 All 62 winners of awards at the 2016 AMCHAM CSR Excellence (ACE) award event in Bangkok pose for a group photo. The Thai-US Creative Partnership Designation Award. The awards were handed out by US Ambassador to Thailand Glyn T Davies at the 2016 Amcham CSR Excellence (ACE) Award event in Bangkok on Nov 22. Highlighting the resort’s long-term contribution in CSR and community development, Laguna Phuket received the ACE Recognition Award, the Thai-US Creative Partnership Designation Award and the US Ambassador’s Award. Amcham’s ACE Recognition honours member organisations that create long-term economic and social benefits in their communities. Laguna Phuket was awarded the ACE recognition in 2015 for its Seedlings Internship Program for marginalised local young adults, and ACE 2016 for its Greening Community Initiative that resulted in 25,000 mangrove saplings planted by the resort, participated by more than 1,000 associates and 450 community members, over the course of 10 years. The Thai-US Creative Partnership Designation Award is bestowed to qualifying member companies. Laguna Phuket is one of the final 62 qualifying members who were appointed partnership from more than 1,000 corporate members. The US Ambassador’s Award is a special and additional award created this year to celebrate the 60th anniversary of Amcham Thailand. The top three finalists were IBM, Dow and Laguna Phuket. Laguna Phuket pitched for the award with its Seedlings Internship Program, which showcases the resort’s policy and view on the Inclusion of LGBTQ and Equality.